The Territory of Orleans was established by the Act of March 26, 1804 and was effective October 1, 1804. It remained a Territory until Louisiana was admitted as a State. The District of Louisiana was created by the Act of April 8, 1812, effective upon the admission of Louisiana as a State on April 30, 1812. The Single district was abolished by the Act of March 3, 1823. At that time the Eastern and Western Districts were created. The Act of February 13, 1845, consolidated the two districts into one district. The Act of March 3, 1849 established two districts again. The Act of July 27, 1866 created a single district. The Act of March 3, 1881 created the Eastern and Western Districts of Louisiana again. The Middle District of Louisiana was created by Public Law 92-208, and was effective April 16, 1972. A native of Sussex County, Virginia, William Claiborne was an intelligent diplomat who learned early in life that he had a flair for politics. The son of a colonel of militia during the American Revolution, Claiborne attended William and Mary College for a time and studied law in New York where he met many influential men, most notably Thomas Jefferson, who would later be important to the development of his career. Because of an overabundance of lawyers in his native Virginia, he relocated to the present day site of Sullivan County, Tennessee, where he began his legal practice and entered politics. From 1797 to 1801, he represented Tennessee in Congress. As a result of his strong support of Thomas Jefferson against Aaron Burr, he was made governor of the Mississippi Territory in 1801. 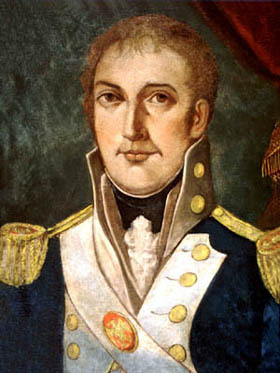 In 1803, immediately following the Louisiana Purchase, he was appointed governor of the Orleans Territory. Creole resentment of the American rule ran high, but Claiborne's honesty, congeniality, and his later marriages to women from good Louisiana families helped relieve any ill feelings that the Creoles may have harbored upon his arrival. While serving as the territorial governor of Orleans, Claiborne successfully aided in the political organization of the territory. In addition, he brought to the people of Louisiana the experience of having a representative government, something that most of them had never known before but had to understand before Louisiana could gain statehood. On April 30, 1812, Louisiana became the eighteenth state of the United States. In the state's first election for governor, Claiborne easily defeated Jacques Villere and served Louisiana from 1812 to 1816. In 1817, he was elected to the United States Senate but died in New Orleans of a diseased liver on November 23, before taking office. By the time of his death, Claiborne had already contributed the greatest gift to Louisianians that he could have bestowed on them: he gave them confidence in their new country and in themselves and guided the young state into the open arms of American liberty and true equality.